Payed or Paid: What’s the Correct Spelling? The correct past tense of the verb pay is paid, as long as the word is used in the financial or transactional sense. If the verb pay is used in a nautical sense, the correct form is payed. What can you do with the verb pay? You can pay for college, vacations, or utilities. You can also pay attention, and you can pay respect. You can pay someone a visit. 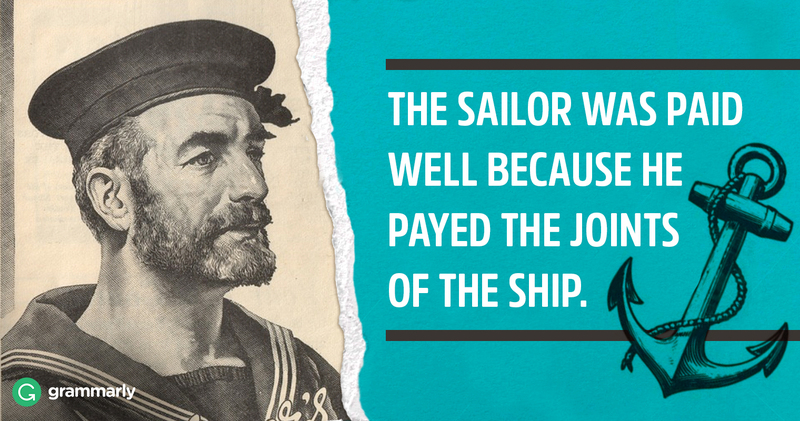 And you can pay out a rope or pay off a ship. There are plenty of things you can do with the verb “pay,” and that’s without going into all the phrases and phrasal verbs it’s a part of. Most of the time, using the verb pay is not troublesome. It is an irregular verb, but not one that’s hard to memorize, so it’s likely you’ll know that its present participle is always paying and that its past participle is paid . . . usually. Pay is a word of Latin origin, which found its way into the English language through the Anglo-Norman paier. The Latin root is the verb pacare, which means “to pacify.” Today, we use pay to say a couple of different things, but most of them have something to do with a transaction—when you pay someone for goods, you’re giving them money for the goods. Or when you’re paying attention to something, you are giving your attention. The meanings of the verb pay that stand out are the nautical ones. In those cases, pay can mean one of several things: it can mean to waterproof joints by painting them with tar and resin; it can mean to let the ship fall off leeward (pay off), or away from wind (pay away); it can mean to let out a rope or chain by slackening (pay out). I paid my debt in full. He payed the deck with tar. She paid out the rope. I payed my debt in full.